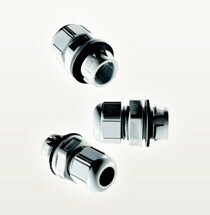 SKINTOP® cable glands ensure a secure connection in a matter of seconds. The universal systems are simple, perfect and easy to install: simply insert the cable, close and go. The cable is securely fixed, centred and hermetically sealed. Universal, quick and easy to assemble. High operational safety and reliability even under strenuous conditions. The perfect fit for every requirement due to a range of versions and comprehensive accessories. Also with bending protection for mobile use. Everywhere where cables are used.